Must be no contrary instructions given to the doctor - it is the patient's right to refuse treatment. Mulloy v Hop Sang (Supreme Court of Manitoba, Appellate Division, 1934). Doctor was suing to have a bill paid for removing the patient's hand. The hand was injured in a road traffic accident and the patient twice told the doctor that he did not want it removed as he wanted to go to Lethbridge (nearest large center) to have it looked at. The doctor said that "he would be governed by what he found at surgery" and the patient said nothing (but he did not speak English well). The court held that the wishes of the patient made clear must be respected and that proceeding against them constituted a battery and trespass - even though the position of the patient was improved. The patient was entitled to damages because of trespass. The patient was in a serious road traffic accident. Her husband had died. She had suffered significant injuries and was bleeding when she was taken to the ER. She was given Ringer's lactate, but her situation did not improve. A nurse found a card in her purse, written in French. When translated, this read "NO BLOOD TRANSFUSION". The card was signed, but not dated or witnessed. The doctor was made aware of the card, but decided to administer the blood anyway as her life was in danger. The daughter arrived 3 hours later and confirmed that the card did express her mother's wishes and that her mother was a Jehovah's witness. An action was brought for battery, assault and negligence. The doctor was not found negligent in his treatment of the patient. The treatment had most likely saved her life. 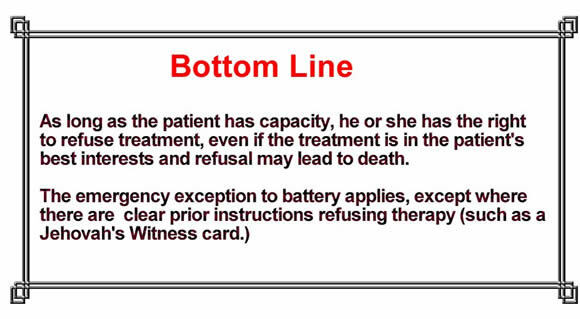 A medical intervention in which a doctor touches the body of a patient constitutes a battery if the patient did not give her consent. 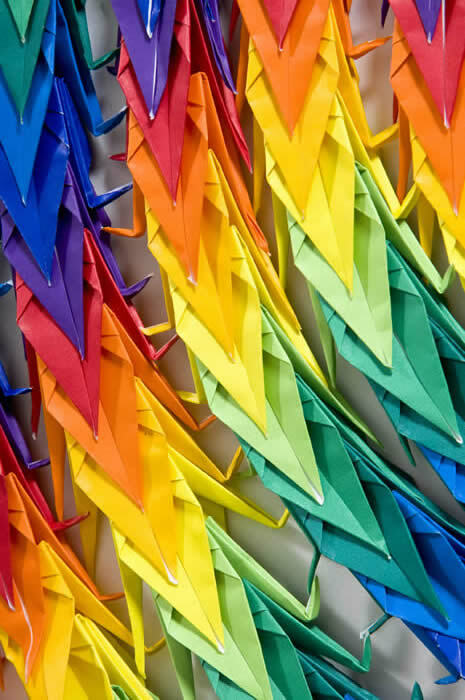 The right of self determination underlies the informed consent doctrine and encompasses the right to refuse treatment. The patient has the final say. A doctor who proceeds in the face of a patient's decision to reject the treatment would be liable. In an emergency situation without the card, the doctor was entitled to administer the blood transfusion. The card was held to be a valid restriction and precluded blood transfusions. The instructions plainly indicated that she had contemplated the situation of an emergency requiring blood transfusion. It was held that the state's interest in preserving the life and health must give way to the patient's stronger interest in self determination. The doctor was found guilty of "technical" battery and nominal general damages awarded.